The first and easiest way to win a copy of Good Birders Still Don’t Wear White is to subscribe to the 10,000 Birds email mailing list. Just go to the upper right hand corner of this here blog, enter your email. click the “Sign Up” button, and confirm your intention to subscribe when you receive the confirmatory email. If you are already subscribed to the mailing list you are automatically entered! One of our email subscribers chosen at random will win one of the copies of the book. 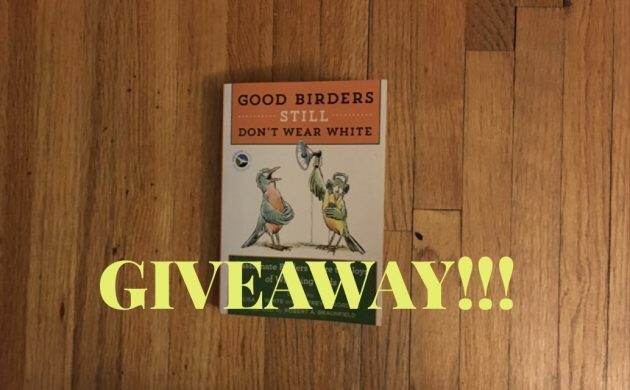 The second and second easiest way to win a copy of Good Birders Still Don’t Wear White is to share this blog post on Facebook while using the hashtag #GoodBirders. In order for us to find your Facebook share and get you entered you have to use the hashtag, share this blog post, and make sure the post is set to “public.” One of the people who follow the directions correctly and share this blog post will be rewarded with a copy of the book. The third and third easiest way to win a copy of Good Birders Still Don’t Wear White is to write a one-paragraph explanation of something that you think good birders do or don’t do. Put it in the email that you send to 10000birds@gmail.com, making sure to include your name, and we will choose one of the entries as the winner of the third copy. We’ll also share your paragraph here on 10,000 Birds in a blog post! You’ll be entered to win a book and become bird-blog famous! How cool is that? You can enter in just one way, in two ways, or, if you are feeling really ambitious, all three ways! (Or, if you’re someone who hates books, birds, and this blog you don’t have to enter at all.) No matter how many ways you enter all three ways options have a deadline of the end of the day next Monday, 27 March. Enter away, awesome readers! This is a very simple way to win a free copy of an entertaining and excellent book! Thanks to Houghton Mifflin Harcourt for providing three copies of Good Birders Still Don’t Wear White for our readers. I’m afraid to ask but why don’t good birders wear white? Is it something to do with Labor day? You’ll have to read the original book to find out why!